For the island in Croatia, see Daksa (island). According to Hindu mythology, Dakṣha (Sanskrit: दक्ष, lit. "able, dexterous, or honest one") is one of the sons of Lord Brahma, who, after creating the ten Manas Putras, created Daksha, Dharma, Kamadeva and Agni from his right thumb, chest, heart and eyebrows respectively.Daksa was a great Brahmin king. Pictures show him as a rotund and obese man with a stocky body, protruding belly, and muscular with the head of an ibex-like creature with spiral horns. According to Padma Purana, when Daksha felt the number of women are still not sufficient, he decided to have 60 more daughters. Sati was the daughter married to Shiva. Bharani. These 27 wives of Chandra are 27 Nakshatras (the constellations) which are on the Moon's orbit. One of the daughters of Daksha (often said to be the youngest) was Sati (Dakshayani), who had always wished to marry Shiva. Daksha forbade it, but Sati disobeyed him and did so anyway, finding in Shiva a doting and loving husband. Daksha Yagna was an important turning point in the creation and development of sects in Hinduism It is the story behind the 'Stala Purana' (Origin story of Temples) of Shakti Peethas. There are 51 (some say 108) Shakti Peethas shrines all over South Asia. The story replaced goddess Sati by Shree Parvati as Shiva's consort, and lead to the story of Lord Ganesha and Lord Kartikeya. Daksha organised a huge yaga and intentionally avoided Shiva and Sati. Even though discouraged by Shiva, who told her not to go to a ceremony performed by Daksha where she and her husband were not invited; the parental bond made Sati ignore social etiquette and her husband's wishes. Sati went to the ceremony alone. She was snubbed by Daksha and insulted by him in front of the guests. Sati, unable to bear further insult, ran into the Sacrificial fire and immolated herself. Shiva, upon learning about the terrible incident, in his wrath invoked Virabhadra and Bhadrakali by plucking a lock of hair and thrashing it on the ground. Virabhadra and Bhoota ganas marched south and destroyed all the premises. Daksha was decapitated and the yagnja shaala was devastated in the rampage. The Bhutaganas' celebrated victory by plucking the beard of 'Presiding Master' of the yagnja, Sage Bhrigu as a war souvenir. Daksha was later forgiven and given life by fixing a ram's (male goat's) head and the yagna was allowed to complete, in all the divinities' presence. The story continues with the act of Vishnu pacifying Shiva, who was in deep grief in seeing the half burned corpse of his beloved wife. 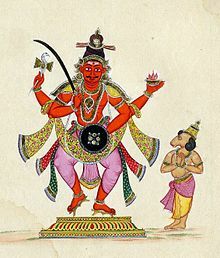 Vishnu embraced Shiva to pacify him. Shiva unable to part with Sati took her corpse and wandered. Vishnu helped him get rid of this attachment by severing the corpse with his divine discus. The body parts of the corpse of Sati Devi fell in the places Shiva travelled. The places where the body parts Sati Devi's corpse fell came to be known as Shakti Peethas. ^ Wilkins, W.J. (2003). Hindu Mythology. New Delhi: D.K. Printworld (P) Limited. p. 373. ISBN 81-246-0234-4.